LATEST RELEASE FROM INFORMIR WITH 12M VOODOO SERVER. This box is the latest release from informir with 12months premium subscription on the voodoo server. The W3 is the wireless version so you dont need an ethernet cable, just connect to you home network. There are litterally loads and loads of content, i will try list as many catagorys as possible, the voodoo server is renowned to be one of the best around but is not cheap, this is usually the case with premium quality. You will receive full support for the whole 12months..... AS YOU CAN SEE THE COVERAGE IS WORLDWIDE. VIDEO CLUB (VOD) AS FOLLOWS. 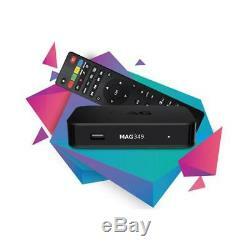 Is a powerful set-top box containing a high-performance processor on the BCM7250 chipset, and 1GB RAM. Its the optimal solution for quick launch of your IPTV/OTT project. This device comes with the most advanced features, making its performance extraordinary. A larger RAM and heavy-duty processor allow you to enhance the velocity of STB. HEVC technology, used in MAG349w3, requires smaller network bandwidth for provision of video of higher quality. MAG349w3 is equipped with dual-band Wi-Fi and ultimate Bluetooth adaptors that provide additional connection opportunities. Premium Class IPTV/OTT Set-Top Box. MAG349w3 is equipped with video compression technology, used to play back video of high quality. Larger RAM and powerful media processor by Broadcom allowed us to increase the velocity of STB. The audio output S/PDIF allows connection of a multichannel high-end system to the Set-Top Box. HDMI 1.4A provides the highest quality sound and image. MAG349w3 is equipped with a dual band Wi-Fi module, Bluetooth 4.0 LE and USB 2.0 ports. This expands the Internet connection and external carriers usage opportunities. The multi-purpose remote control allows managing not only the Set-Top Box, but also operation of other devices. You can connect a wireless keyboard and mouse through a USB port for more comfort when operating MAG349w3. Compatibility With Any TV System. The Set-Top Box MAG349w3 can be connected through HDMI cables. Infomir Set-Top Boxes is approved with CE, FCC and EAC certificates that guarantee their quality and accordance with international standards. Processor ARM A15 (B15) Core CPU 1.2 GHz. DRM optionSecure Media, Verimatrix Standart Profile (MAG350). Middleware supported Ministra TV-platform, SoftAtHome. HDMI 1.4a-output, Composite + stereo A/V output, Audio output S/PDIF, Ethernet 1 Gb/s, 2 USB 2.0, Built-in Wi-Fi 2.4 GHz/5 GHz ac (optional). PC and NAS in local networ, Stream media protocols (RTSP, RTP, UDP, HTTP), USB-devices. Audio odecs MPEG-1 layer I/II, MPEG-2 layer II, MPEG-2 layer III (mp3), Dolby Digital plus (optional). Audio formats MP3, MPA, M4A, WMA (optional), OGG, WAV. Video modes 1080i, 1080p, 720p, 576p, 480, PAL, NTSC. 265 (HEVC), MPEG4 part 2 (ASP), WMV-9 (optional), VC1 video, XviD; 3D and HD video supporting. Video containers MKV, MPEG-TS, MPEG-PS, M2TS, VOB, AVI, MOV, MP4, ASF, QT, WMV. Image formats JPEG, PNG, BMP, GIF, RAW. Power adapter 12 V 1 A. The item "Infomir Mag 349w3 Genuine Latest Release Set-Top Box Dual Wifi VOODOO SERVER" is in sale since Sunday, April 29, 2018. This item is in the category "Sound & Vision\TV Reception & Set-Top Boxes\Other TV Receivers/Reception". The seller is "supaview" and is located in Bradford. This item can be shipped to United Kingdom.